Advanced Document Systems and Supply carries 12" 4:1 coil binding supplies and coil binding machines for all your coil binding projects. 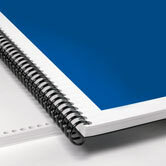 Plastic coil binding is good looking and tough enough to withstand mailing. It is the only coil binding system to combine a sharp, professional look, and is strong enough to snap back after being crushed as the coils will regain their shape. 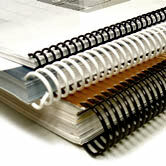 Documents bound with plastic coil will open fully and lie completely flat. Plastic coil is easy to use as you simply insert the coil through the holes. This can be done manually or electronically. 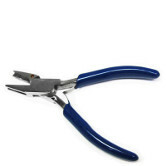 We carry plastic coil in many colors, pitches, and lengths, as well as Coil Crimpers which allow you to cut and crimp the coil binding ends so your pages and covers stay in place. Stock lengths for coils are 12 inch for most binding jobs including Letter or A4 size documents. The 36 inch length is normally used for large and unusual size coil binding jobs. Coil can easily be cut to fit any size job, so pick the length that is most economical and suitable for your coil binding system. 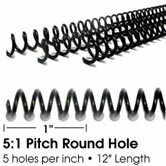 See our spiral coil size chart below for the available sizes. Plastic coil is available in 5:1 pitch in smaller sizes (6 to 25 mm) and 4:1 pitch in all sizes (6 to 50 mm) 4:1 pitch (four holes per inch) is the most common Spiral Plastic Coil. Check your punch for the correct pitch to use.